Amanda Holges is a Business Mentor, Mastermind Facilitator, Podcaster and Speaker with 30 years experience of running her own businesses, and uses that knowledge to work with others to grow their own. 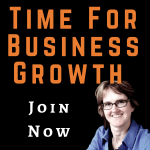 – Welcome to my Time for Business Growth Tips. Thank you for being here. Today, we’re going to talk about the things you hate in business, and three ways to deal with them. Unless you are VA, secretary, bookkeeper, or accountant, I’m guessing you didn’t set up your business due to your love of admin, invoices, or paperwork. In fact, if I hazard another guess, I reckon these could be the things that you try to put off and only do because, well, it has to be done. But they are an inevitable part of business, so they aren’t going away any time soon. The worst part is that they can really play on your mind. You’re going to find something, and because you haven’t filed it in the best way on your computer or in your office, it takes that much longer to find it. Your valuable time wasted. Or you do some work for someone, and you don’t invoice them for a few days or a week or so, or you don’t get around to chasing the payment. That means even longer before your hard work is paid for. Then there’s the end of the year struggle to get your accounts done, just so the tax man is happy. So much time struggling to sort things out in the midst of everything else you need to do. So what can you be doing about the tasks that you hate? Assuming that you’ve checked the task really has to be done, my first tip is – Tech It. If you need to keep it, use technology to help. If it’s a document or information, scan it and save it in an app, such as Evernote. You can save all sorts of media, from handwritten notes, documents, articles, audio, photos, and video, and you can save it into different notebooks and tag them. Searching is then so much easier. You can also add files and emails direct, and items from the web, all searchable in one place. No more wasting time searching through piles of paper or in numerous computer folders. As part of the Evernote programme, I’ll put an affiliate link in the comments to help. My tip number two is – Pass It. Find those people who love admin and figures and who did set up their companies because it is their passion and they’re good at it. Much better than you, if you’re honest, and they could be giving you your time back to do the things in the business that you need to do and love. This could be time spent making more sales or finding new products or expanding your network or planning your future. Don’t think of it in terms of what it will cost, but what it will allow you to do. Lose the brain fog of trying to do it for yourself, and just be presented with the information that you need at the end of it. It will take them less time than you, and give you back your freedom to get on with the stuff that you enjoy. Remember, delegate well. If you have a process, share it with them. If you have a certain way you like things, talk to them about it, but be open to suggestion. After all, it is their area of expertise. Tip number three is – Plan It. If it really is just down to you, then plan it in. Start with a regular hour a week and see how that goes. Don’t think I’ll need a day just to start looking through this backlog. You will probably never find the time to do that until it becomes too late. Check that you really need to do it and make a start. Then after an hour, stop and get on with your next task. It will be an hour getting closer to getting things sorted. And think about when to plan it in. First thing Monday morning or last thing on Friday are just going to make putting it off even more likely. Find a regular slot and keep to it. So there you go. Three tips for those jobs that you hate. Whatever they may be. Tech It, Pass It, or Plan It. They aren’t going away any time soon, so just do it. If you want some more information on finding others to help grow your business, then head to my resource page, amandaholges.co.uk/resources, and download my Who’s Next? Guide. This provides information on how to recruit others from local or virtual admin support through employing staff and getting the support of a mentor. So don’t struggle on with the jobs that you hate. They are not worth the time or mental energy that you are wasting on them. Use the three tips and download my Who’s Next? Guide at amandaholges.co.uk/resources now. Thank you for listening today. Please feel free to comment, review, and share this with others so they can find the Time for Business Growth, too.